Zucchini Slice – A quick and easy favourite! A winning slice of goodness! I am often left with a few zucchinis in the fridge wondering what I should cook up. 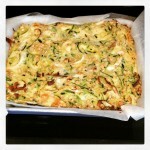 One day my lovely friend Penny gave me this yummy Zucchini Slice recipe which has become a family favourite. It has the goodness of zucchinis, leeks, oats and lots of protein to keep blood sugars stable and hunger at bay. It is delicious hot, warm or cold so it is a real winner! Grate the zucchinis coarsely, place in a colander, sprinkle with salt and toss well. Leave for 30mins and then squeeze out excess liquid. Mix the zucchini with the finely chopped leek, oats, feta, eggs and pepper. Press into a greased 25cm square dish. Bake for 45 minutes until the top is browny golden in colour. We like to have this Zucchini Slice with a big side salad (tomatoes, cucumber, lettuce, avocado, red cabbage, snow peas etc), or with some fresh steamed veggies (broccoli, carrots, green peas, spinach etc). Of course, I always top my veggies with our favourite Magic Dressing!